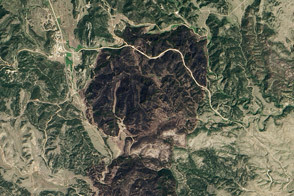 The Moderate Resolution Imaging Spectroradiometer (MODIS) on NASA’s Terra satellite captured this natural-color image on August 1, 2012. Both storms were at typhoon status on that date, according to Unisys Weather. 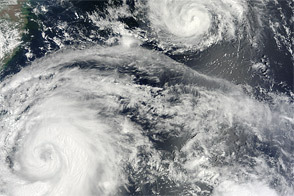 The larger of the two storms, Saola, caused widespread destruction in the Philippines and Taiwan, news reports said. The Associated Press reported that Saola had caused 29 deaths and 21 injuries in the Philippines, and had displaced nearly 180,000 people. 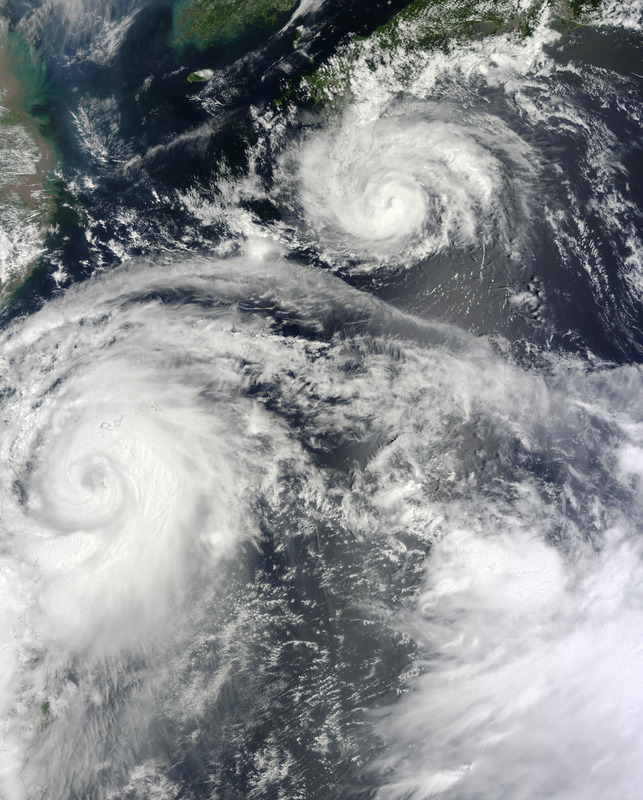 In Taiwan, the storm had caused five deaths and left two people missing. As airport officials canceled dozens of flights, authorities released water from all of Taiwan’s major reservoirs in preparation for potential flooding. 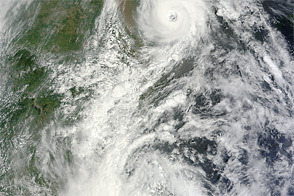 Damrey was expected to come ashore in China before Saola, making landfall north of Shanghai early in the day on August 3. 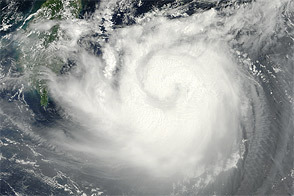 Saola was expected to arrive hours later, making landfall south of Shanghai. 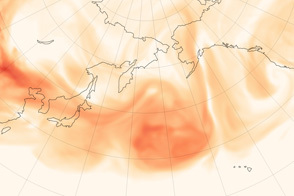 Acquired August 1, 2012, this natural-color image shows Saola and Damrey over the western Pacific Ocean. 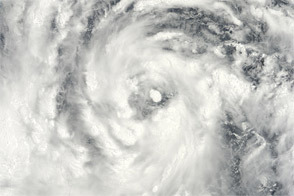 Saola formed as a tropical depression over the western Pacific Ocean in late July and soon strengthened into a typhoon. Associated Press. 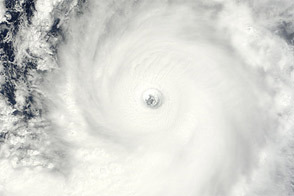 (2012, August 2) Typhoon Saola wreaks havoc across Taiwan, Philippines. The Hindu. Accessed August 2, 2012. Joint Typhoon Warning Center. (2012, August 2) Tropical Storm 11W (Damrey) Warning Storm Track. [Online] URL: http://www.usno.navy.mil/NOOC/nmfc-ph/RSS/jtwc/warnings/wp1112.gif. Accessed August 2, 2012. Joint Typhoon Warning Center. 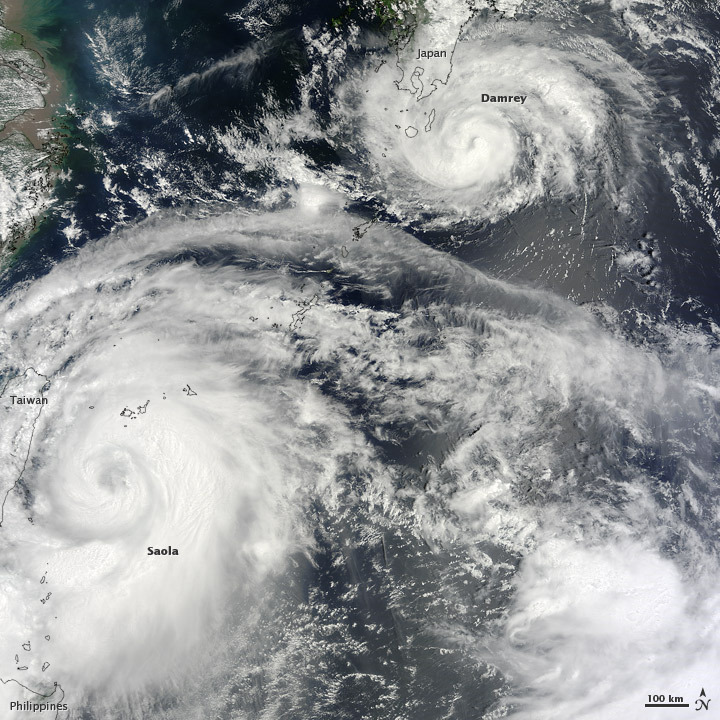 (2012, August 2) Tropical Storm 10W (Saola) Warning Storm Track. [Online] URL: http://www.usno.navy.mil/NOOC/nmfc-ph/RSS/jtwc/warnings/wp1012.gif. Accessed August 2, 2012. Unisys Weather. (2012, August 2) Damrey Tracking Information. Accessed August 2, 2012. Unisys Weather. (2012, August 2) Saola Tracking Information. Accessed August 2, 2012. Voice of America. 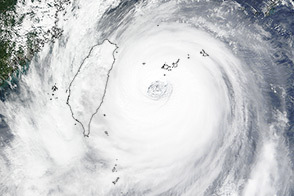 (2012, August 2) Typhoon Saola batters Taiwan, takes aim at China. Accessed August 2, 2012.